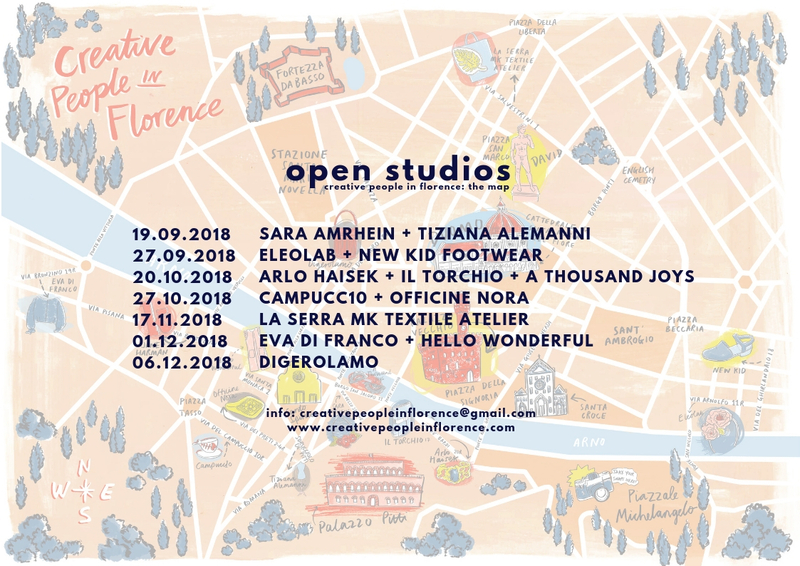 The Creative People in Florence Map (#CPiFMap) features fourteen artisans and designers across the city whose work spans jewelry, accessories, fashion, design objects, housewares and more, all exclusively handmade in Florence. More than just a network of shops, all the points on the map are also working art or design studios where visitors can meet the designers and see their products being made. To introduce to you the CPiFMap team, we have packed our fall calendar with an exciting series of Open Studio Visits. Join us to meet the designers, learn how they built their brands and maintain their practices, and get a peek behind the scenes at their busy workshops, studios and ateliers. On December 6 from 6:30-8 meet Clara Soto, the designer behind the handbag and accessories line Digerolamo (Via del Moro 58r). She’ll tell us how she got her start learning the trade and setting up her own successful brand in Florence. All are welcome! Free and fun. On December 1 from 5-7:30pm, join us at two fashion design studios to discover the new collections by Eva di Franco and Hello Wonderful. We’ll meet at 5pm at in via Bronzino 19r to learn about Eva’s design philosophy and how she develops each piece with unexpected shapes and geometric cuts. Then we’ll walk (or bike!) down to Via Santa Monaca 2r to learn about how the design duo behind Hello Wonderful got their start. Come along to ask the designers about their materials, tools and techniques, learn how they built their brands, and meet other curious creatives like yourself. All are welcome! Free and fun. Join the Facebook event here. On November 17 from 5-6:30pm, join us to take a look behind the scenes of La Serra MK Textile Atelier. We’ll meet Margherita Pandolfini at the beautiful greenhouse studio La Serra MK Textile Atelier (via Salvestrina 1) where she and co-designer Karl Jorns produce hand-painted textiles. Come along to ask the designers about their materials, tools and techniques, learn how they built their brands, and meet other curious creatives like yourself. All are welcome! Free and fun. Join the Facebook Event. On October 27 from 5-7pm, join us to explore two busy Oltrarno creative co-working workshops, Campucc10 and Officine Nora. We’ll start at Campucc10 (in via del Campuccio 10r) at 5pm to meet the artists and designers who share the space and learn about their work, then we’ll head over to Officine Nora (via dei Preti 2-4r) to check out the diverse styles of the jewelry designers who work there. Come along to ask the designers about their materials, tools and techniques, learn how they built their brands, and meet other curious creatives like yourself. All are welcome! Free and fun. On Saturday, October 20 from 5-7:30pm, join us to explore the workspaces ofA Thousand Joys, Il Torchio and Arlo Haisek, three of the designers featured on the Creative People in Florence Map. We’ll starting at Jow Franklin’s jewelry studio (Borgo San Jacopo 11) at 5pm, then will move down the street the Erin Ciulla’s bookbinding workshop, Il Torchio (via dei Bardi 17). Finally we’ll head down to Via dei Bardi 20r to check out Arlo Haisek’s jewelry design studio. Come along to ask the designers about their materials, tools and techniques, learn how they built their brands, and meet other curious creatives like yourself. All are welcome! Free and fun. On September 27 from 6-8pm, join us to explore the workspaces of Eleolab and New Kid, two of the designers featured on the Creative People in Florence Map. Starting at Eleolab (Via Arnolfo 11r) at 6pm, we will meet Eleonora, and learn about her line of exquisite accessories and clothing, including headpieces, silk flowers and jewelry. Then at 7pm we’ll head around the corner to check out New Kid and their collections of footwear, accessories and fashion. Come along to ask the designers about their materials, tools and techniques, learn how they built their brands, and meet other curious creatives like yourself. All are welcome! Free and fun.